In Akan symbolism there is a design of crossed crocodiles, two joined crocodiles that share the same stomach. 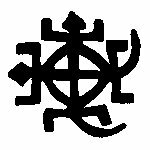 You can find the description at the Akan Cultural Symbols Project by scrolling down the page of Akan Political Beliefs. I have always been particularly fond of this as a symbol for the competing interests of constituents in a democracy. FUNTUMFUNAFU DENKYEM FUNAFU – JOINED CROCODILES Symbol of UNITY IN DIVERSITY, DEMOCRACY, and UNITY OF PURPOSE The symbol is also referred to as odenkyem mmemu – Siamese twin crocodiles joined at the stomach. From the proverb: Funtumfunafu, denkyemmfunafu, won afuru bomu nso wodidi a na worefom efiri se aduane ne de ye di no mene twitwi mu. Literal translation: Two headed crocodiles fight over food that goes to a common stomach because each relishes the food in its throat. This symbol, in essence, depicts the Akan notions about the inherent difficulties of reconciling individual and group interests in a democratic system. Democracy and democratic institutions are profoundly important, though there are lots of different ways it can work. Democracy is how we establish equality of opportunity. Without democratic participation and controls, business, markets and capitalism are simply organized crime. I have a home in Ghana where I hope to retire, but currently have a job I like, live in and am a citizen of the US. I am part of some start up small businesses in Ghana, and with another family member have several small farms, growing cocoa, chickens, sometimes pigs, and a variety of vegetables. We take pride in paying people well who work for us, and try to help create opportunities. People being people, sometimes that works better than others. I have followed events and US Africa relations for a number of decades now. I am old enough that I observed the rivalries and proxy wars of the cold war in Africa, when the US and Russia poured “military assistance” onto the continent, and the death and devastation that created. Friends and I used to joke about applying to Reagan and Bush 1 for military assistance to help us in our petty arguments with each other. It appeared all you needed to get military assistance was to call your enemy a Communist (now replaced by Terrorist.) AFRICOM seems designed to make it all happen again, only this time it could be far more devastating. I decided this time I would record what I see, what I learn, and what I think, hence the focus on AFRICOM in this blog. I comment on what I observe and how it fits in the history I have seen. I have a lot of other interests as well, and they are likely to show up here from time to time. You can reach me at crossedcrocodiles [the usual at] gmail [dot] com. This blog started out as Crossed Crocodiles on blogspot. I have moved the archives here to wordpress. On this, or any webpage, you can use the keys control-f to look for a specific word or phrase on a webpage. This may be useful when going through blog archives. Here are some general suggestions finding African blogs. Pambazuka News has a review of African blogs that comes out approximately weekly. Look at the blogs mentioned. Check their blogrolls. Check the comments for links back to the commenters’ blogs. Global Voices Online where you have the choice to look by country, topic, author, or you can search. Use the blog searches, google blog search, ask.com blog search etc. Or use bloglines, technorati, wordpress, or others. Search for names or topic words that may be specific to certain countries or regions, or add the name of a country or region to your search words. Good hunting and good luck. I’m looking for good, varied African blogs that reflects Africas diversity and greatness. I’m looking for African bloggers living in Sub-Saharan Africa. We’re looking for a variety in style and content, so most bloggs will be of interest. So far, I’ve found a few Kenyan, South African and Nigerian blogs, but very few good ones from other countries. I also haven’t found any good blogs in French yet. So, if you know of any good blogs (in English or French) please send me a mail!! I wrote Tom a note, but here are some general suggestions for anyone else who drops by and has the same question. Pambazuka News has a review of African blogs that comes out approximately weekly. Like your site, well done! How do you like to be cited, by name or simply xcroc? I think xcroc is best for citations, or possibly Crossed Crocodiles. Many thanks for your nice complement and your interest. This is an Excellent Site. Will you be willing to accept Items from Other Blogs/Zines that cover African Activities by the United States? Thank you for the compliment! As to accepting articles, I don’t have any plans to do that. I don’t have time to devote to editorial work, or for managing a blog or website in that way. I barely have time to respond to occasional comments, though I truly appreciate comments. It is always possible I might make an exception at some point, but I have no plans or intentions to at present. I very much appreciate your interest. Nice blog brother. I have written a lot about Canadian mining companies. The rest of the world just thinks Canada is cool. But their economic interest is dirty and genocidal. It gets worse because Canadian companies pay fund, arm and pay militias to do the dirty work of creating chaos while they do the mining. Many thanks for your interest and kind remarks. I read your article which is very good. I’m copying your comment above and adding it to the article on Canada and mining in the DRC. That way people interested in the subject might more easily find your article. Many thanks for the comments you posted on my blog – it was very kind of you to do so. I think you are a very good writer. I am also glad to learn that you farm in Ghana, too. My own family has farmed in parts of Eastern Ghana since the early 1900’s, fgroim the colonial era. It’s no easy task farming here – but its nice that we can be stewards of parcels of land that we farm sustainably in harmony with nature (and our neighbours), which will be eventually handed over to the next generations of our families, is it not? Peace and blessings to you, O kindred spirit – and keep up the good work! I greatly appreciate you stopping by to comment and have been way too slow in replying to you. I am an admirer of your writing. Based on what you write, I think you have one of the best understandings of what working democracy really is, or really should be, of anyone I have encountered. That is the reason I put you on my blogroll. I admire what you have to say. I hope you keep writing and I will continue to read your work. You should come back here and run for parliament! na, what a waste of talent. Wonder how long we would hear your voice if you lived here in Ghana before you ran out of steam. Hope you check out this neophyte blogger’s site at http://www.madinghana.wordpress.com. Anyways carry on pressing buttons-incidentally I wonder if anyone here is listening? Many thanks for your visit and kind words. I have some sympathy with your wrestlings with the bureaucracy, and I like your blog. I also took a look at your hotel online, Four Villages Inn, and it looks lovely. I hope I get a chance to visit there sometime. I don’t write too much about Ghana because I am not there most of the time, and I think a country should belong to the people who are living there, who have the most right to comment. It is too easy for me to miss important information. I write more about US and international dealings with Africa, which I have followed for some time. I think it will be awhile before I am in Ghana for any length of time again, as I find myself in the micro scale farm subsidy business. This is actually very exciting, as the hope is to build it up success to be able to provide reliable jobs and educational opportunities for a number of people. If the IMF, punitive trade agreements, hugely subsidized western agriculture, and the economic effects of the oil business don’t crush Ghanaian agriculture, again, we have a good chance. I just returned from a semester in Ghana and I found your blog on a whim while looking for some information on Chinese development in Ghana. Thanks for hosting such a great blog that discusses the multi-faceted issues of Ghana and other countries in Africa. I’m impressed by your articles! Your blog is educative. Thank you for your work, this Blog. Let me congratulate you on the regular high quality of information that you are always providing here and on pan-africanist-briefs@googlegroups. Your site and your articles are excellent. I added this site as a link on my blog, so my readers may visit yours too, and I will keep following and re-blogging essential articles posted here. My first time here and my first impressions..
1. Good site. This is my first exposure to Uganda issues. 2. Please reconsider your use and conceptualization of “Democracy”, as more and more Americans are finding out that the USA is a “Constitutional Republic”, not a Democracy (YouTube has good videos explaining this). 3. I think Uganda is fascinating in that it appears to be in the beginning phases of possibly more US involvement. This is not necessarily good since our USA congressman and intelligence do not seem to learn from the past. It would be good to review histories of other efforts that started with foreign aid. Maybe a future travesty could be avoided. Nice site. I’ll keep reading. A Constitutional Republic is still a form of democracy based on representation in contrast with direct democracy. Representative Democracy or Constitutional Republic which is not deeply and diversely representative is actually a form of bureaucracy and autocracy. And that is what describes the government system in the U.S.A. in my opinion. Good representative democracy must have equal and separate representation of men and women in all legislative institutions. It must also have parliaments shared equally between the political, economic and social institutions. It is more like Consensus democracy but with wider and deeper representative dimensions. It is not excluded to political parties only. But rather involves trade and business unions (economic representation) and also ethnic and cultural communities (social representation). Representative Democracy is too big and too serious to be left to political parties and bureaucrats alone. Crossed Crocodiles, I ask you to investigate and bring to attention the motives, the main players and the consequences of transforming the EEC into the European Union on Europe and the World. The implications of these major political, ethical and economic shifts are very much impacting democracy and development in Africa. I have deep suspicions about the EU and I want to know your analysis about where Europe is going and why? WASHINGTON — As Gen. William “Kip” Ward traveled around the world as the head of the military’s U.S. Africa Command, he spent hundreds of thousands of dollars in excessive hotel costs and allowed unauthorized family members to travel on his government plane, according to a Pentagon investigation. The Defense Department inspector general has completed its investigation into Ward’s activities, and the issue is under legal review. Panetta’s options regarding Ward are limited by complex laws and military guidelines. Panetta can demote Ward and force him to retire at a lower rank. Because Ward’s alleged offenses occurred while he was a four-star general, he could be forced to retire as a three-star, which officials said could cost him as much as $1 million in retirement pay over time. That Army office long has been used as a holding area for general officers of varying ranks. For some it’s a way station where senior officers under investigation go to await their fate. For others, it’s a quick stop en route to a new high-level command or assignment, a place they can hang their hat for a few weeks, working on special projects until their new post becomes available. As a result, Ward’s base pay went from more than $20,000 a month as a four-star to about $14,000 a month as a two-star general. Defense officials said that if the decision is to allow him to retire as a three-star or four-star, he would not receive any back pay for the 15 months he served at the lower rank. A key element of Ward’s job was to dispel worries about the new command, meet with African leaders and work to expand and strengthen U.S. military ties so that the nations there are better able to provide for their own defense.